Correctly analyzing any situation is a key to success and to clarity. If you could evaluate a situation, and tap into hundreds of minds to see it from many other perspectives (but in minutes instead of weeks or months), just think of what that could produce for you. 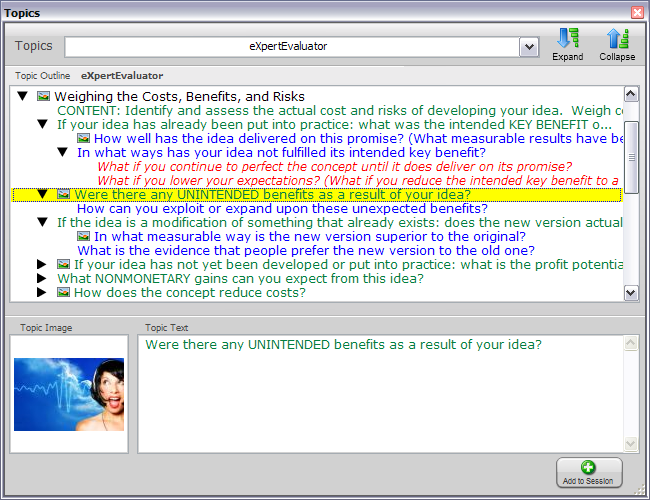 That’s the power of the ThoughtOffice Expert Evaluator Module. Successful leaders in schools, companies and governments world-wide use this module to open their minds to possibilities, and to prompt them to remember key issues and how to address them. We tapped the combined intellect of more than 200 PhDs, business leaders, and domain experts, and condensed their expertise into this powerful module. And once you have the Expert Power of ThoughtOffice behind you, changing the world is a whole lot easier. 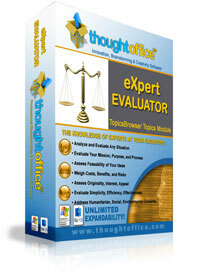 NOTE: the Expert Evaluator Module is included free with any order of the ThoughtOffice core program, or any ThoughtOffice bundle! It’s our gift to you, to get you started brainstorming, right away.